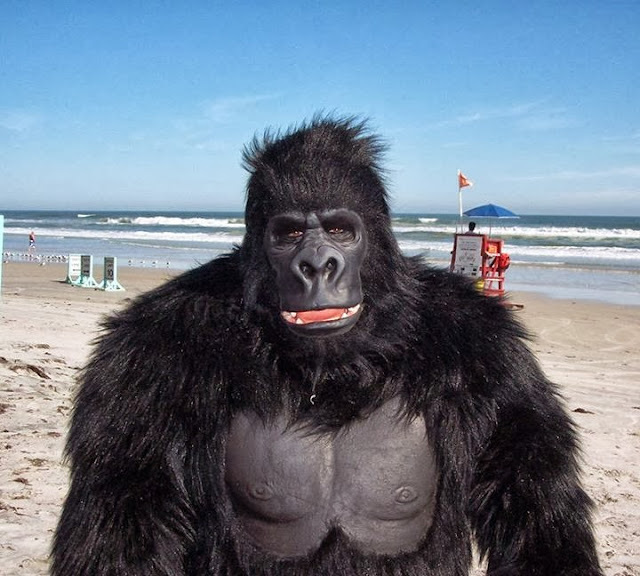 Hollywood Gorilla Men: So you want to be a gorilla man?...part 5...let the fur fly ! So you want to be a gorilla man?...part 5...let the fur fly ! Alrighty then gang, This will be the final step to the modification of our over the counter mask mod. Now that we have our jaws munching happily, we'll finish trimming out the fur. The first thing we'll do is remove the rubber bands from the hooks so the jaw will stay open. This is so the fur will be glued down at the maximum distance the move will travel. If it were closed and we glued fur down, it would keep the mouth from opening, see? I start by gluing down the fur that we peeled away from the mouth area when we cut the jaw off. 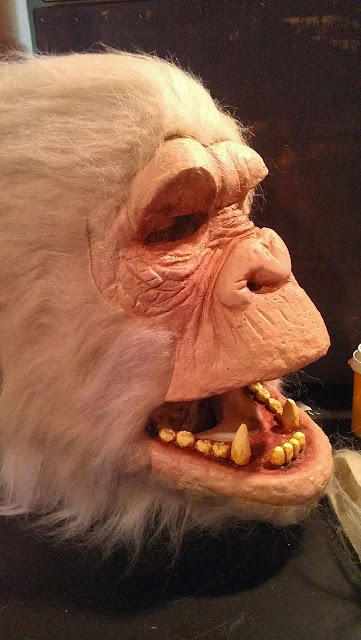 I used contact cement to secure the fur cloth and I carefully lay the fur right over the back edge of the open jaws. I tucked the fur into the mouth to conceal all the work we did to the mouth up to this point. When both side are glued and tucked, put the rubber bands back in to make sure the mouth still closes all the way. If it doesn't, carefully trim away the fur you tucked into the mouth. Trim from the sides and work inward. A not so quick word about working with fur cloth: note that the fur has a nap to it. This means that the fur comes out of the cloth at an angle giving direction to the fur. 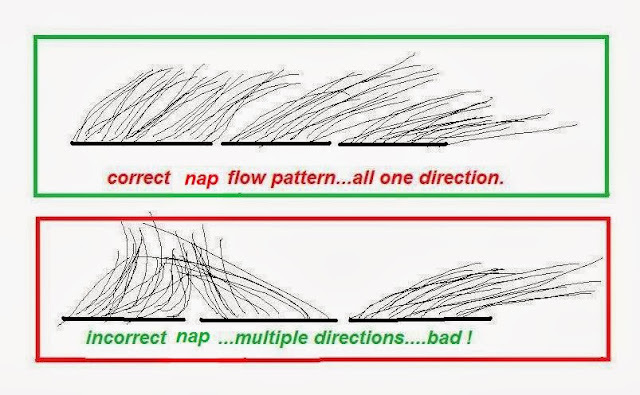 You need to be sure that the nap direction remains the same throughout the fur application or it will look like a mess. The heavy black lines below represent the backing of the fur fabric. When you glue additional fur down, put the edges of the fur fabric as close to the previous piece as possible. This way, when it gets brushed, the fur will appear seamless and natural. Also you will want to overlap the fur as you apply it. Not the cloth backing per say, but the strands of hair. 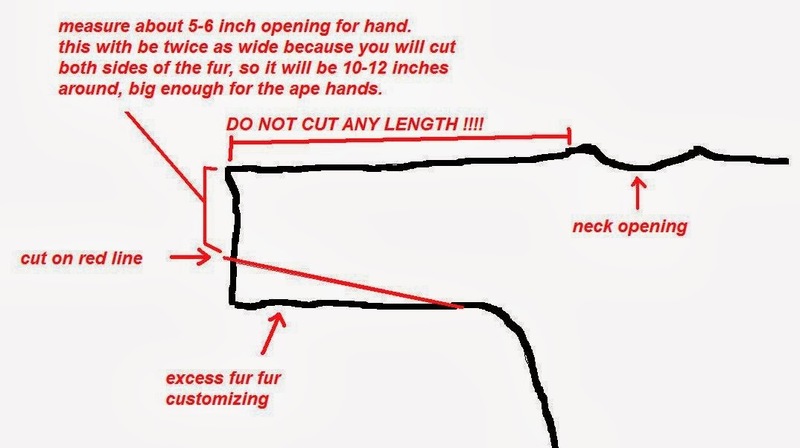 Another important note about working with fur...DON'T CUT THE FUR !!!! Cut ONLY the cloth backing ! Do this by cutting with the fabric side up, and slide the bottom blade of the scissors though the hair so it touches only the cloth backing and pushes the hairs aside. Now cut pieces of fur to cover the areas you want to hide or customize. 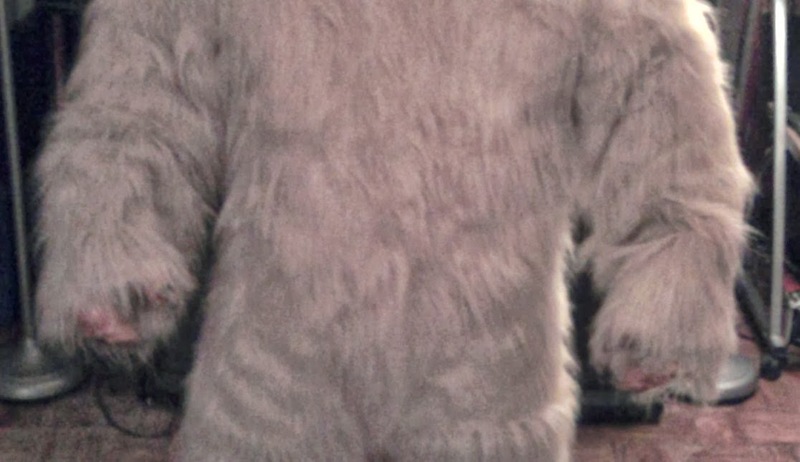 The additional fur can be harvested from parts of the suit that are too big. On the suit I am using, The sleeves hang open about 10 inches too wide at the wrist. Suits will vary. 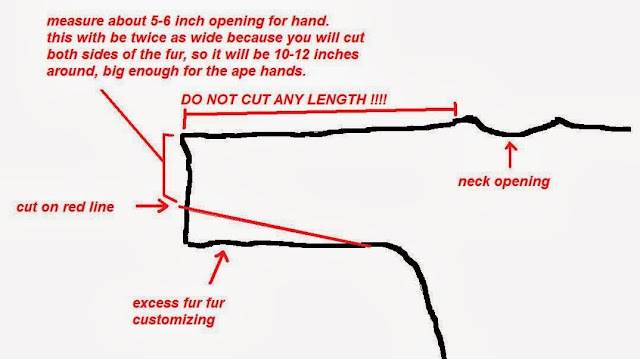 If you DO have a surplus of fur, at the wrist area, (additional width).you can do the following to harvest fur. Always TURN THE SUIT INSIDE OUT WHEN DOING ANY CUTTING OR SEWING ! Now you can sew the sleeves back together. Now for the secret to success when sewing fur...a hair brush ! 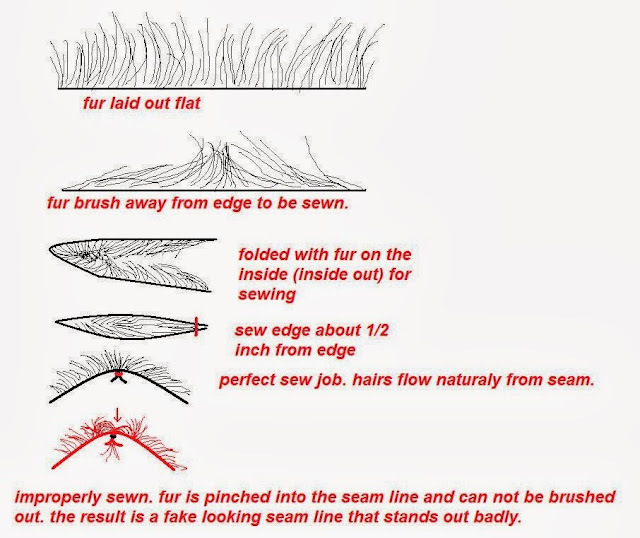 When sewing fur, either by machine or hand, ALWAYS brush the fur AWAY from the seam line !!! 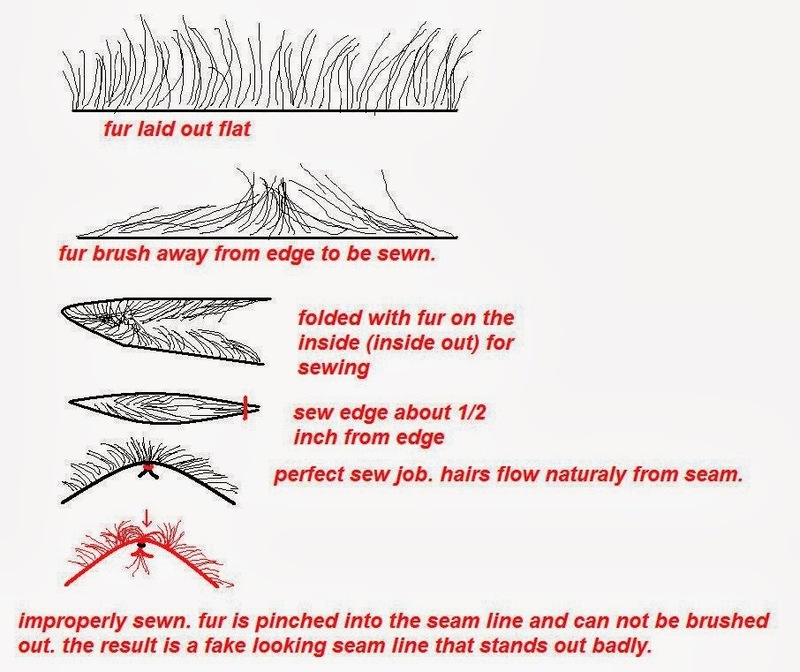 This is the basics for all fur work. These techniques can be used in both Chris Walas's and this one. 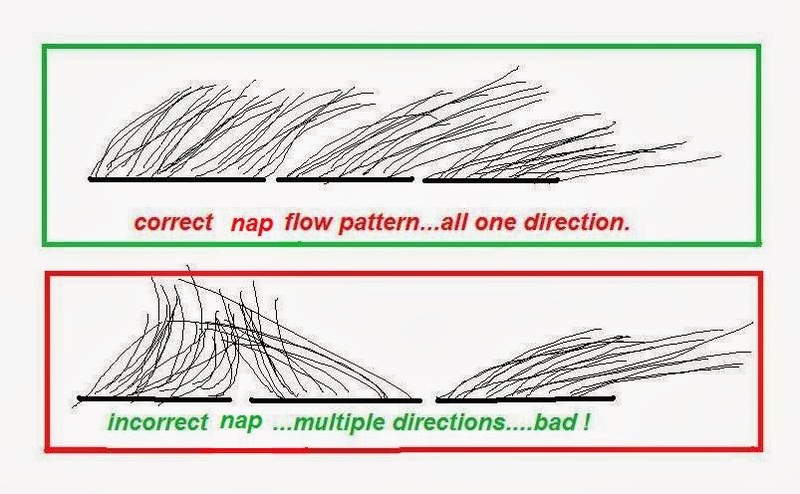 It will also be the proper technique for any fur project. 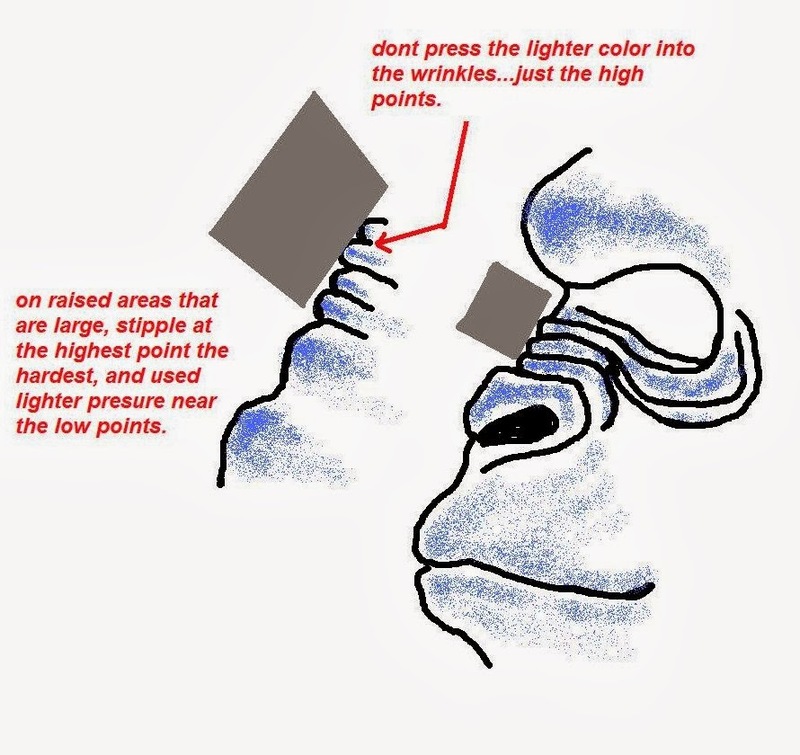 There you have it gang, the greatest secret to ape suit happiness in the known universe. OK, that was a lot of info and a hell of a lot of work to try to explain. I'm hoping it all makes sense because we really want you to succeed with this project ! If you don't have any fur to spare, you should be able to find a standard black fur in any large fabric store There are different grades of fur, so be aware of that and try to find the closest match to yours. Now, FINALLY back to our head. 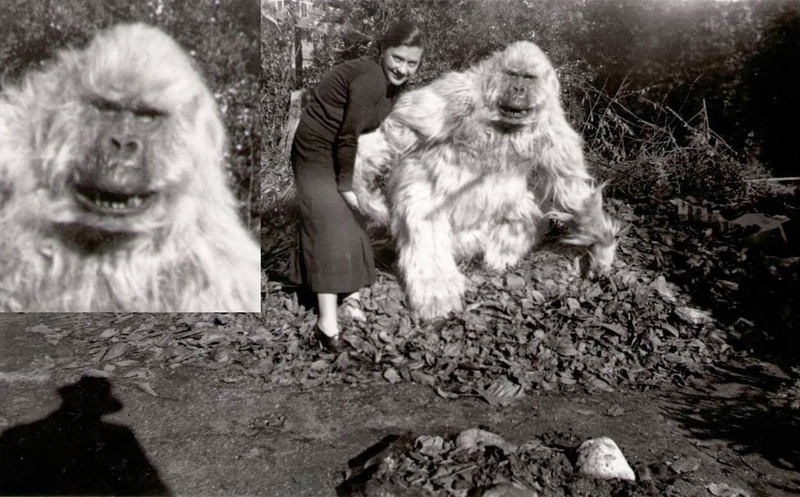 OK, we've got our extra fur.. Find a photo of an ape suit, (or real ape if you want) whose fur you really like. 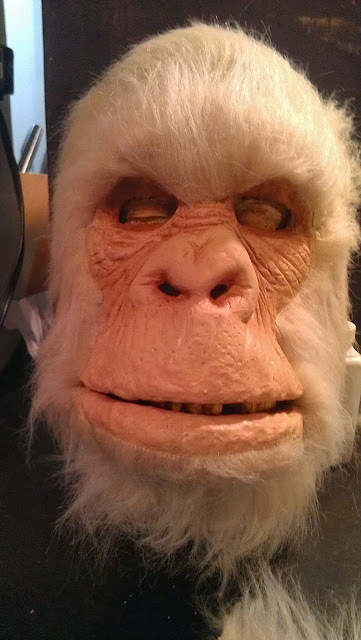 I really like the look of the great Charlie Gemora's white gorilla, so that's my objective. 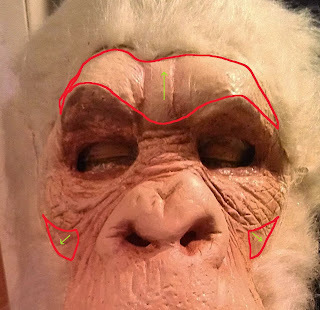 First, cut shapes of fur, (using proper cutting technique, and noting fur nap, or direction) to approximate the hairline you want. Glue these in place with your contact cement. Place the edge of the fur cloth as close the the edge of the cloth on the mask as possible. BE SURE THE NEW FUR LAYS ON TOP OF THE EXISTING FUR SO THE EDGE DISAPPEARS !!! It should blend in with the pre-existing fur and look something like this. notice how you can see the edge of the fur fabric. Now we'll change up our adhesives. You can use either liquid latex tinted to the color of the skin, (as we used for the mouth)..OR..you can use rubber cement, like you find in the school supplies. (Borden's is a good brand) the rubber cement dries clear, and holds the hair beautifully. 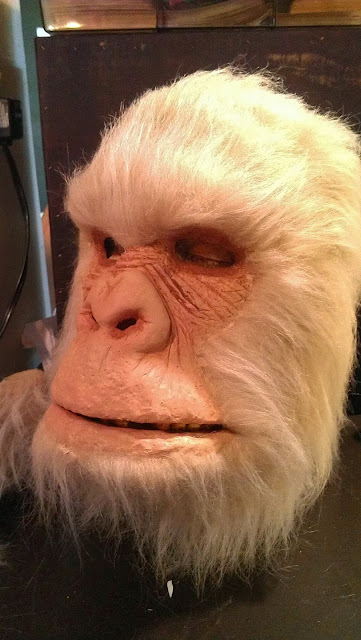 We are changing glue, because we're done with the fur cloth. Now we're going to learn to lay hair. To start, we need to get the hair ready. To do this, use sharp scissors an cut off a strip of fur, off of the fur cloth. Cut it as close to the cloth as possible. be careful to leave it just as you see it in a tight row. Cut only a couple of inches at a time. Now, brush the fur we just added, back away from the face, exposing the raw fabric edge. This is what we are hiding. paint a stripe of glue, fairly wet, along the front edge of the fur you just added. Carefully pick up the strip of hair you just cut, and lay it into the wet glue, with the ends of the hair, laying over the fur cloth. 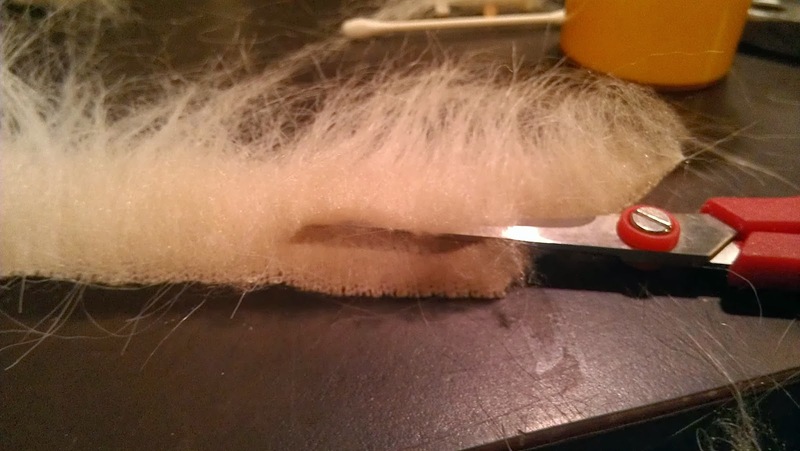 press the cut edge of the fur into the glue with a Popsicle stick, or the edge of the scissors. When finished it looks like this. The latex is still drying so it looks white against the skin color. It will dry down to the same color and disappear. If the glue doesn't quite disappear completely you can do a wash with a darker color than the face . If your suit is black, use pure black acrylic thinned down with water. blot the excess paint with a paper towel. The acrylic will bond down hard to rubber cement, so it won't come off. 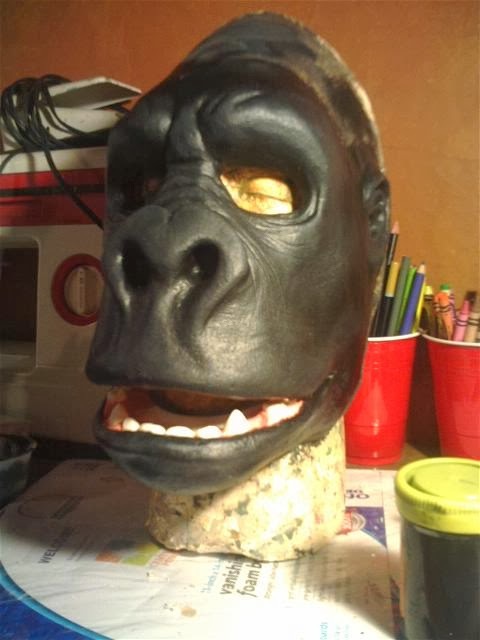 Chances are your gorilla will have a black face so we'll change directions a bit, and I'll use my own bongo head as an example of rendering a black gorilla face. I say render because while it looks black, it really isn't. This is a shot of Bongo on the beach, catching some rays. See how you can see all the nice details of the face? All the bumps, wrinkles, and creases are very visible, but yet he still looks black. To render black that shows up as natural, both in real light and on camera, start with a base coat of black. Most likely the mask you bought is black, so we'll start with that. You will need a small amount of foam rubber for this trick. Take your black acrylic paint, and put a small amount in a Dixie cup. About an ounce. Now add about half an ounce of latex to it, and stir. The latex will keep the paint from cracking as the mask gets used..they take a beating. Pour off about half of that into another dixie cup.add a couple of drops of white paint to the black mixture. Don't add more than that! it will dry down to light if you do! Now take a piece of the foam rubber that has at least one flat side, and dip the flat side in the mix. Blot it a few times on a plastic lid or an empty cup bottom as you don't want it too wet. Now, lightly stipple the mixture over the mask, keeping it away from the hair. Don't push to hard because you don't wand the lighter paint to go into the wrinkles...you only want to hit the high points. Now go back to the dark grey mixture, and add another couple of drops...but this time use even less paint ,and even less pressure. stay on only the topmost parts of the face. this way you have 2 levels of high light. If you've kept it very subtle, it should look very natural and really bring out the details. Here is a shot of Bongo that I color adjusted to help you see the stipple details. OK gang, That's how to do your head ! This has been a long post, and a lot of work, so I'll run a different post or two before we start on the body. It won't be long I promise ! 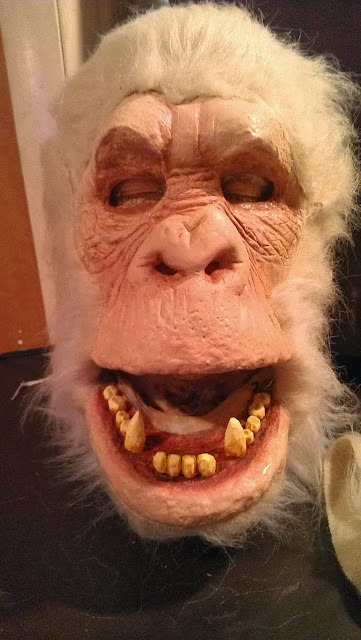 You've seen the ferocious white gorilla from crap mask to full on gorilla monster. Now gang, I want you all to make a head better than you could ever buy ! Next time on "So you want to be a gorilla man ?" we'll get into some mighty muscles ! 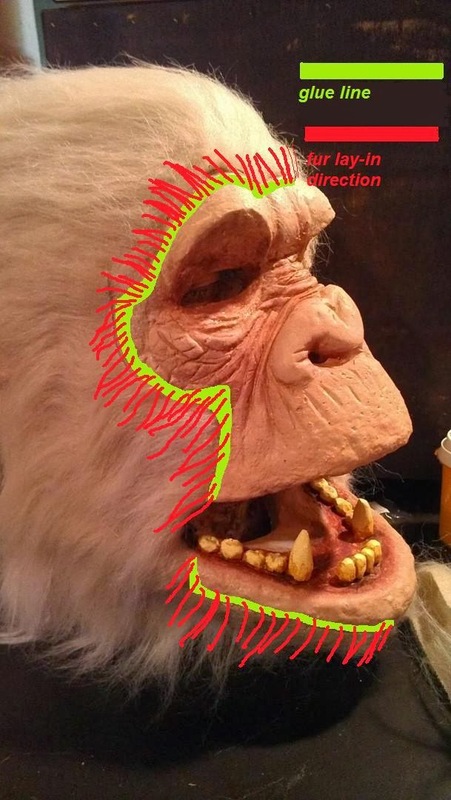 Labels: fur application, painting, So you want to be a gorilla man?...part 5...let the fur fly !